Cykada engages distant poles, analogue worlds crashing with electronics, Eastern influences crossing with Western, harmonising nostalgic moments with dancefloor bangers. This band of established musicians on the London scene is made up of members of Ezra Collective, Maisha, Where Pathways Meet, Myriad Forest, Family Atlantica and Don Kipper. Bassist Jamie Benzies is the spine of the project, along with Tilé GichigiLipere, also a fellow former member of the legendary band Myriad Forest and drummer Tim Doyle aka Chiminyo, together were the first members of Cykada. Trumpeter Axel Kaner-Lidstrom, saxophonist James Mollison and secret weapon guitarist Javi Pérez complete the ensemble. 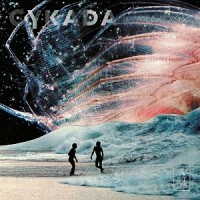 Millie says: Cykada have a hugely broad sound from jazz, electronic and inspiration from across the globe. Refreshingly diverse they have paved their own way in the world of upcoming jazz. If you like Nubyian Garcia, Ruby Rushton and Ezra Collective you’ll be right at home here.